Sixers guard Marco Belinelli shoots the game tying basket late in the fourth-quarter past Celtics forward Jayson Tatum and guard Terry Rozier. The 76ers are heading into the playoffs for a second consecutive year for the first time since 2012. Below players and coaches from the Sixers and their two playoff opponents reflect on the most memorable moments from the Sixers’ 2018 playoff run. Last season gave many of the Sixers players their first taste of postseason basketball. Riding a 16-game winning streak, the Sixers stormed into the playoffs and beat the Miami Heat, 4-1, to advance to the second round. But the story isn’t as simple as that. Joel Embiid was sidelined for the first two games after suffering an orbital fracture and returned wearing a mask that had a story line all its own. The series, while short, was physical, with multiple altercations, and for the Heat, a disappointing end. JOEL EMBIID: I had the mask and had to watch the first couple of games and I hated it. We got it done and that was the good thing. BRETT BROWN: It was a tough series. We ended up winning it, 4-1, but it didn’t feel like that. They are physical and well-conditioned. Those things come to mind when you talk about the Miami Heat. BEN SIMMONS: For me, I’ve always been a big fan of Dwyane Wade, I used to wear his Converse shoes when I was younger, so to be on the court with him was huge for me. JJ REDICK: It was a physical series, they always play us physical. Walking off the floor from Game 4 and clinching that win on their home floor was one of the better feelings I’ve had as an NBA player. There’s something about winning tough physical games on the road, especially games that come right down to the end. ERIK SPOELSTRA: Being up 12 at home in Game 4 then having to watch that go away. I’ll remember that. Those things happen. We’ve been in situations both ways with this franchise, been up 15 with six minutes to go in Game 2 of a Finals that we ended up losing — not that I’m still thinking about that — but we’ve also stormed back from deficits like in 2013. It’s all competition, you learn and grow from it. Sometimes it can be exhilarating and sometimes it can be crushingly painful. But, this is the world we all wanted. DWYANE WADE: Probably the end of [Game 5] is the biggest because, I don’t know if anybody remembers, but maybe the last 12 seconds I just dribbled the clock out and had the ball at half court. I thought maybe that was the end for me last year. I remember thinking I started my career here [in Philly] and I’m going to end my career here. That sticks out. Just looking around the arena and being in that moment and thinking full circle. 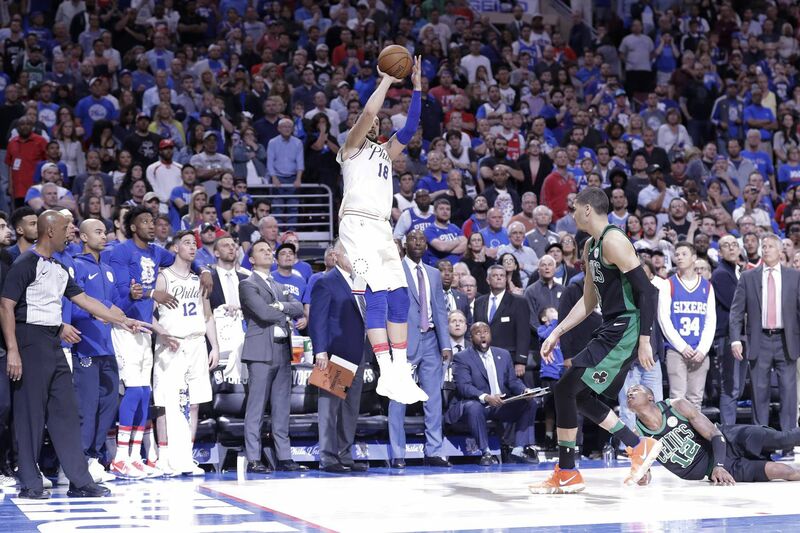 The Sixers’ Eastern Conference semifinal matchup against the Boston Celtics did not go as smoothly as the first, and the thoughts shared by Sixers players were more about the disappointment and reflecting in order to grow. ​ The Celtics beat the Sixers, 4-1, to advance to the Eastern Conference finals, where they were bounced by the LeBron James-led Cavaliers. BRETT BROWN: The memories don’t go away ... you always learn. Our summer was very dictated and influenced by our loss against Boston and schematic stuff we’ve got to get better at and change.​ The road map that we had, there wasn’t any guesswork. This is what the league and the playoffs tell us about deficiencies on our team and the direction that we should be going. JOEL EMBIID: Last year was unfortunate, it’s behind us. ... I watched every game, including the playoffs probably twice, especially that last game, I watched it a lot. The layup that I missed to tie the game, how close the games were, except the first one. I watched it all. It was painful. ROBERT COVINGTON: That series helped. We had a bitter taste in our mouth going into the summer after that, but it was a good lesson. Then you go into the summer knowing that the preparation that you put in is going to impact what happens the next time you are in the thick of it. That’s what I think about. The Celtics, on the other hand, are able to look back with joy about that series. After a grueling seven-game series against the Milwaukee Bucks, the Celtics were more than pleased with how the series against the Sixers went. Then, of course, there was Game 3: The Confetti Game. With 1.7 seconds left to play, Marco Belinelli shot what he and most people thought was a buzzer-beating three-pointer to win the game. Confetti fell at the Wells Fargo Center, all while the play was under review and ruled a two-point shot to send the game into overtime rather than end it. The Celtics then went on to win, taking a 3-0 lead in the series. TERRY ROZIER: Now you know I’m going to talk about the confetti drop. I think we were up two, I knew it wasn’t a three for them to win. I was wondering why it was dropping because when I fell and he hit the shot, I was right there. I’d seen that he had his foot on the line. Then they had to pick all of it up, so that’s how that was. We had to wait for 20 minutes and warm back up, but as long as we were able to get the win, that’s all that mattered. To go up 3-0, that was huge. JAYSON TATUM: My favorite game was Game 3. It was the first and only road win we had last season in the playoffs. That was big for us. Just to come into somebody else’s house and win that in overtime. Belinelli hit that shot and they thought it was a three and the confetti came down. We had to wait so long, it was like 20 minutes, and that was a tough game that came down to the wire. JAYLEN BROWN: It’s all blurred together now, I don’t even think back. I guess that confetti game was pretty cool. They thought the game was over, but we came back on the floor and got the win.